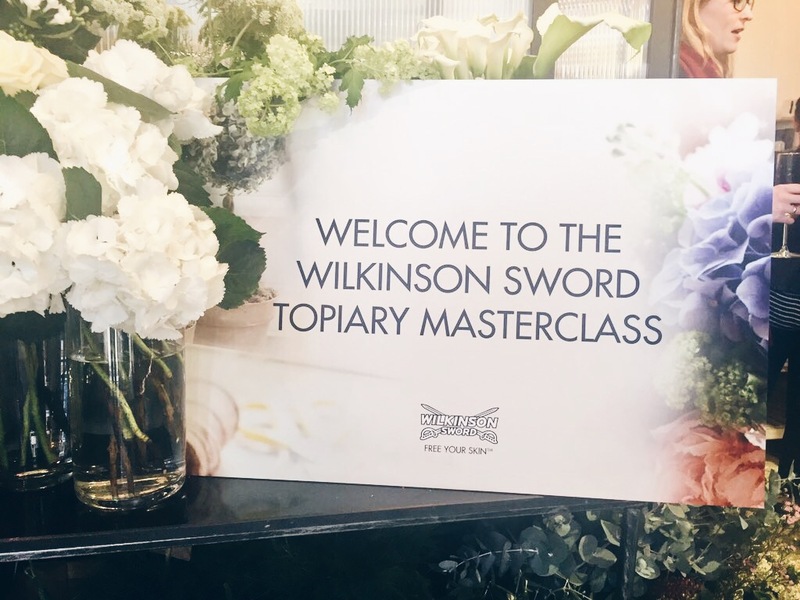 Last week I have been invited by Wilkinson Sword to take part in a topiary class lead by a a celebrity florist, Jamie Aston and learn about the new Wilkinson Sword Hydro Silk Bikini Razor and Quattro Bikini Razor. The event was so lovely and I learnt a great, new skill – topiary! Topiary is the art or practice of clipping scrubs or trees into ornamental shapes. European Topiary dates back to the Roman times. Within the atrium of a Roman house or villa, a place that had formally been quite plain, the art of the topiarius produced a miniature landscape (topos) which might employ the art of stunting trees. Jamie Aston is a leading florist of his generation, with a unique style and and a great expertise. He is often called upon by the world’s elite names in fashion, film, music and dance. His main floristry school is based in London, and another one just opened in Seoul, South Korea. The trees that we made during the event with my fellow bloggers, were made from scratch by us! We were given a knife, scissors, a Wilkinson Flower pot, wet oasis and dry oasis. The first step was to cut the dry oasis so that it fits in the pot. The wet oasis was then shaped into a ball, and a wire was wrapped around it. It was then very important to precisely push the twig inside the ball (half way) and into the dry oasis. This was then a base for the flower arrangement. Each girl got a set of flowers and she could arrange them anyway she wanted, keeping in mind that the ball should be round and the balanced. After the ball was complete, 3 mosses were available to choose from and they would be placed at the base of the tree. It may seem challenging at first but once you learn the rules and follow them, it is quite easy and very enjoyable! You can make it more difficult by adding more elements to it like moss, twigs and green elements, the beauty of topiary is that you can do whatever you like! Yes, it is great fun, and I really enjoyed arranging the flowers. I went to the class prior to my exams and I must admit that this activity was very relaxing and distressing. You can be as creative as you want so the more you experiment the more fun it will be as well. This lovely event was organised by the Wilkinson Sword to demonstrate the two new products, Wilkinson Sword Hydro Silk Bikini Razor and Quattro Bikini Razor. It was such a great idea to connect topiary with learning about the management of bikini. I will post a full review of both trimmers as soon as I try them as summer is fast approaching! For now you can check them both at Wilkinson Sword Website. I hope spring is treating you well, and that wherever you are in the world, you are getting some sunshine! Being a candle addict, there is nothing better for me as a warm evening gorgeously lit by candle lights. This month I have been trying the candle from Willow and Honey, a British brand owned by three siblings, focusing on making beautiful products and fragrances. All the soy wax candles are handmade, in the heart of English countryside. Let me start with the fact that I am a fan of Willow and Honey’s mission statement which is, ‘Lift the mood of every room by creating a range of beautiful products and fragrances which deliver a euphoric and memorable experience’. This mission statement fits in perfectly with the brand and their products, as immediately after lighting the candle, I experienced an improvement in my mood and a feeling of internal calm. The scent of my candle was Eau Verbena, which is a mix of lemon verbena and lemongrass with a base note of fresh freesia. For me, a scent has power when it brings back memories, and this fresh citrusy smell reminded me of a warm evening in Verona when I was sitting outside, watching a beautiful sunset. When I light the candle, and kept it on for about two hours, the scent filled the whole room and was quite long lasting. My favourite style of interior design is when everything is white, so you can imagine that this candle straight a way found a place in my room and in my heart. The candle is made of milky white glass, as you can see on my photos, so it will fit into any interior style which makes it a perfect gift idea for anyone. If you love candles, and are a fan of beautiful things with beautiful scents, you should give Willow and Honey a go. The products are stunning, so you can always reuse them for makeup brushes or use them as a candle holders. The Verbena candle is perfect for the summer period, and it will make the summer evenings cosy and romantic! Willow and honey website, £12.50. 3. Try Willow and Honey products! During the London Health Show I discovered a lovely brand called Fair Squared. As you might have realised from the name, the brand sells fair traded cosmetics. The entire range is licensed and certified by The International Organisations governing Fair Trade, ensuring that the producers get a fair price for the products. I love brands which are trying to give something back to the community and are not purely focused on sales, which is why I think that Fair Squared is a great brand. I have dry skin, so I am always looking for shower gels which will be hydrating. This shower gel is formulated with olive which helps to moisturise and cleanse the skin. It is also an antioxidant which soothes, rejuvenates the skin and slows down the ageing process. I am a fan of body butters and I use them like they are water! The Green Tea Body Butter, like the Lime shower gel has a very refreshing smell. It is made with fair-trade Shea Butter from Burkina Faso, fair-trade olive oil from Palestine and fair-trade green tea from India. The Fair Squared products come in a variety of smells and uses as you can see in the samples above. The next one that is on my list to try is the Olive Hand Soap! So many of my friends have been asking me to recommend them a great scrub, and lately I have been using so many different brands but to be honest with you, the most effective and the best value for money is a coffee scrub which you can make at home. All you need is freshly ground coffee, coconut oil, sugar, coarse sea salt and almond oil (optional). Put coconut oil in a glass jar and put it in a microwave until it is in a liquid state. Gradually add the coffee while mixing, then add sugar, salt and almond oil. Mix well and leave it for 1 hour, when it solidifies, I suggest you use a spoon to mash it up so it is easier to use. This coffee scrub can be used as a face scrub as well as body scrub. It has amazing results on face, especially if you have dry skin, and scars or acne, it will reduce the marks and improve your skin’s condition. It can also be used as a body scrub, as it helps to get rid of cellulite and fade stretch marks. I usually use it twice a week and it makes my skin feeling smooth and hydrated. On the 8th of February Melvita is launching its New Nectar De Roses Hydrating Body Collection. It combines 3 types of blossoming wild roses, featuring the wild rose extract which is known for activating skin hydration. So if you suffer dry skin, and are looking for something gorgeously scented, you are going to love this collection! The range is available on Melvita website. Let me start with my favourite product from this range. I am absolutely in love with the Eau de Toilette, the scent is very fresh, feminine and subtle. The main ingredients consist of 3 wild roses which come from Drome, Bercors and Chile. The bottle is just the perfect size, and lately it has become my handbag essential, and I always use it on the go. Even thought it is very delicate, the powdery scent is long lasting. Definitely a must have! (Available for, £36). This is a beautifully scented shower gel. The smell is light and it stays on the skin for a little bit after you shower. I really liked its texture as it is quite thick but when mixed with water, it transforms into foam. Thanks to the gorgeous scent, you will feel like you are in a garden full of roses. (Available for, £13). When I started to use this I thought it will be very light and slightly hydrating, but it is actually very hydrating. It is quite runny and it absorbs into the skin quickly so you don’t need to wait for 20 minutes before getting dressed. Like the shower gel, it has a stunning smell of rose, which is very light and not dominating. The body veil is enriched with Rose Floral water, and it provides instant hydration, keeping your skin moisturised throughout day or night! (Available for, £15). This balm can be used for lips, dry skin, cuticles and even hair ends to provide instant hydration. The scent of this balm is very light, as it is enriched with the Shea Butter which is known for its nourishing and repairing properties. As the name suggests, it consists of 3 Roses: Canina Rose, which stimulates the circulation and moisture, Gallica rose, known for regenerating properties and Mosqueta rose which hold the moisture in your skin cells. I really like this product as it is hydrating, smells fantastic (I know, I am so repetitive!) and the packaging is beautiful! And who doesn’t love a multipurpose product? It is convenient, saves space in your bag an just makes life so much easier (Available for, £10). 3. Get ready for spring!